There is nothing I love more than storycatching, and of all the stories that come my way the ones that intrigue me the most offer a glimpse into the creative process. There I was wide awake at dark-thirty Saturday morning, mousing around on the computer looking for something absorbing to take me out of my own head. Apparently Margie Guyot was wakeful too, because pretty soon an email popped up. Did you see the northern lights? I woke up at 4 this morning and looked out the window. Unusually bright. Hmmmmm… I threw on my robe & slippers and drove to Rex Beach. And it was just spectacular! The whole northern sky was shimmering & pulsing with pale light! I’d have done cartwheels with joy, but who’d call 911 for me? A shooting star even zipped through it. Wow. Was happy I had some afghans still in the car from my last painting-schlepping venture — it was pretty chilly. I love living up here! Unlike many photos, this display was not green or red. It was a kind of “colorless color”. But that was OK. They did pulse and shimmer and it was enough for me. I made a quick pen sketch of the composition, since I hadn’t bothered to take my paints & easel along. It looks pretty rough — I was trying to sketch by the light of the dashboard. And I stared at the sky, making mental notes of the colors. Surprisingly, the sky at night is not always as pitch-black as we think. 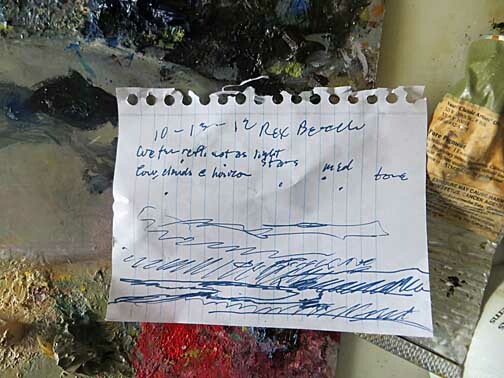 She enclosed a copy of the sketch. I love this stuff. But there was more. I did a little painting of the scene later Saturday morning. Hoping for more grand displays! According to SpaceWeather, there should be plenty more. 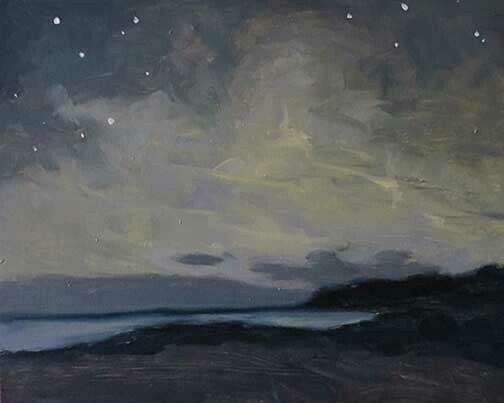 I am a big fan of Margie’s night sky paintings, and this one just delights me. It turns out she did a post about it for her own blog, too (Northern Lights! ), but what the heck, never too many aurora posts. And when I am wakeful tonight, I will wrap up in my down coat and take the Duo for a walk on the beach. SpaceWeather says there are likely to be more polar geomagnetic storms streaming across the night sky. I got up twice in the night last week because we were promised a sighting but there was nothing doing. Now I am suffering from aurora envy. Ha ha! Too cool! Thanks for including my story. If you want me to call you next time I see the Northern Lights, let me know. We’ve got a little network going up this way. Thank you for sending the images. I would definitely like to be on the Northern Lights calling network. Beautiful painting. I’ve only seen the aurora once. All white. 360 degrees. Wouldn’t mind seeing it again! Isn’t it fine, though? The silvery aurora dances over Stone Circle every now and then. Satisfactory. I’ve seen the rose and green lights, but only up in Rhinelander – outside it, actually, in Pine Lake. Excellent skywatching there. A very charming painting! And now, yes, I’m going to run right over to check out Margie’s blog…. Good plan. And watch for her paintings at various venues in TC, too – she’s been getting out and about, she has. Yes, the northern lights were even sighted here last week, no, better than that, they were sighted in the south of England! It’s often cloudy here so I guess that’s why we didn’t see them in the north. I love Margie’s night skies too. This is another winner. Isn’t it wonderful when they dance into view? Just knowing that they might is very nice. What a beautiful painting – and what an extraordinary phenomenon. I often sigh over photos of colored auroras, but I didn’t realize they could be silver/white. So lovely. I never have seen one of any sort, so it’s good to get reports from Up There. You probably know of the Space Weather site, but if you don’t, you’ll love it. I hope you get to see them one day. From a “quick pen sketch” to this wonderful painting… your friend Margie is talented indeed. Lovely story, thank you. I’m glad you enjoyed it. I expect one day you’ll come upon a scrap of just the right midnight blue and the next thing you know there will be a bit of Northern Lights in a quilt made of African fabrics by a woman living in Switzerland. Astonishing world, really.